What’s New in the Lowcountry? A new trolley service will be up and running this summer. It is sure to be a hit with passengers with its range of features. There will be Wi-Fi, an area for strollers and wheelchairs, mobile apps, bicycle racks, GPS tracking and air conditioning! Shelter Cove, Park Plaza and Coligny Beach are some of the convenient stops, but drivers will allow passengers to get off at any safe location. Fares are $1 and children short enough to fit under the bus bar can hitch a ride for free. The trolley service is designed to reduce traffic while making sure everyone enjoys a great island experience. The first two buses represent a bit of local history. The “Alligator” was named after native Charlie Simmons’ freight boat that was used to ferry goods and people to the island before the bridge. The second one is “The Comet”, named after the resident Marsh Tacky horse residing at the Coastal Discovery Museum. These horses were introduced to the area by the Spanish in the 16th Century as work horses and are an interesting facet in local history. 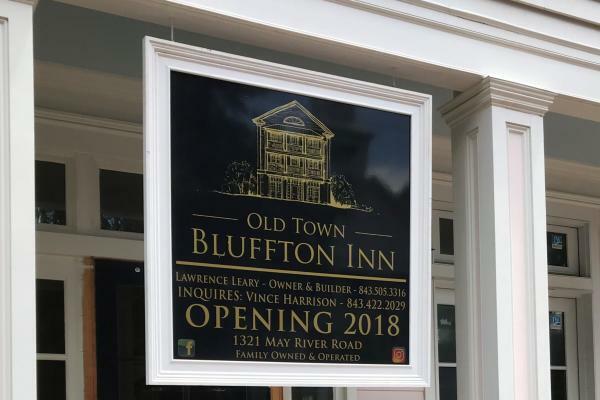 The Old Town Bluffton Inn is scheduled to open soon. This is a boutique hotel, located on May River Road and within walking distance to shops, galleries and a wide array of eateries. Visitors will be able to park their cars and enjoy a very relaxing visit. Taking an early morning or late evening stroll to the May River will help visitors discover why the river is, and has always been, the heart of the community. Quaint shops, historic structures, and blazing colors over the water make cameras essential. With a little luck, guests may be able to capture a special photo as a lasting memory of the intriguing landscape. Old Town is loaded with history so there is much to see and learn. The inn has been designed to fit into the local scene with a timeless architectural grace. The suites have been appointed with a new line of luxury furnishings inspired by and especially created for the inn. Wide porches, architecturally detailed millwork, and stunning suites overlooking the street scene will give visitors a new perspective of the town and hopefully will provide some inspiration to its guests along the way.